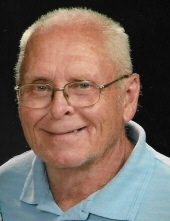 Jerry Wayne Hurst, 74, of Palmyra, formerly of Maywood, MO, passed away Friday, April 12, 2019 at The University of Missouri Hospital in Columbia. Funeral Services will be at 10:00 AM Wednesday, April 17, 2019, at the Lewis Brothers Funeral Chapel in Palmyra, MO. Reverend Eric Anderson and Reverend Helen McFarland will officiate. Visitation will be from 5:00 PM - 7:00 PM Tuesday, April 16, 2019, at Lewis Brothers Funeral Chapel. Burial with full military rites by Boots Dickson Post #174, will be at Greenwood Cemetery in Palmyra, MO. Mr. Hurst was born May 22, 1944, in Maywood, MO to Clarence Gaines and Ruby Irene Leach Hurst. He was married to Marjorie Gayle McFarland on December 12, 1970, at the United Methodist Church in Palmyra, MO. She survives. Other survivors include daughters; Kristy Kay Bross (Greg), Susan Renee Ragar (Troy) both of Palmyra, MO; brother Richard Hurst; sister Patty (Susie) Stierlin both of Quincy, IL; sister in-laws, Rev. Helen McFarland of Salsbury, MO, Karen McFarland of Palmyra; Grandchildren, Christopher Janes, Dalton Janes, J.C. Bross, Sophia Ragar, Weston Ragar, and Hadley Ragar; two great- grandchildren, Declan Janes and Juvia Janes, eight nieces and nephews, numerous great- nieces and nephews and extended family. Jerry was preceded in death by his parents, daughter Jennifer Elizabeth Hurst, brothers, Robert and Marvin Hurst, sisters, Mary Lepper and Leota Fern Hurst, in-laws, Claude and Virginia McFarland, brother in-law Perry Stierlin, sister in-law Marilyn Hurst and nephew Randy Stierlin. Jerry attended school at Ewing High School in Ewing, MO. Professionally Jerry served 3 years in the Army in the 44th Engineer Battalion, Camp Carroll, South Korea. He received an Honorable discharge as a Sergeant E-5 in 1968. Jerry received special recognition in Korea as part of a 4- man flag core, carrying the flag for parades, special occasions and pass in review for the 44th Engineer Battalion. He came home and worked as a machinist for Electric Wheel in Quincy, IL, as a supervisor for 13 1/2 years. Jerry then started his own business as a General Contractor for 11 years before he retired in 1998. Jerry was a member of the American Legion Post #174 Boots Dickson and the Palmyra VFW. He was also an attending member of United Methodist Church of Palmyra, MO. Pall Bearers will be Greg Bross, Troy Ragar, J.C. Bross, Christopher Janes, Dalton Janes and John Drebes. Honorary pall bearers will be Sophia Ragar, Weston Ragar, Hadley Ragar, Annette Ragar, Charlie Bross, Carrie McKinney, Randy Crabill, Jim Lovelace, Kenny Peters and John Hobbs. To send flowers or a remembrance gift to the family of Jerry Wayne Hurst, please visit our Tribute Store. "Email Address" would like to share the life celebration of Jerry Wayne Hurst. Click on the "link" to go to share a favorite memory or leave a condolence message for the family.